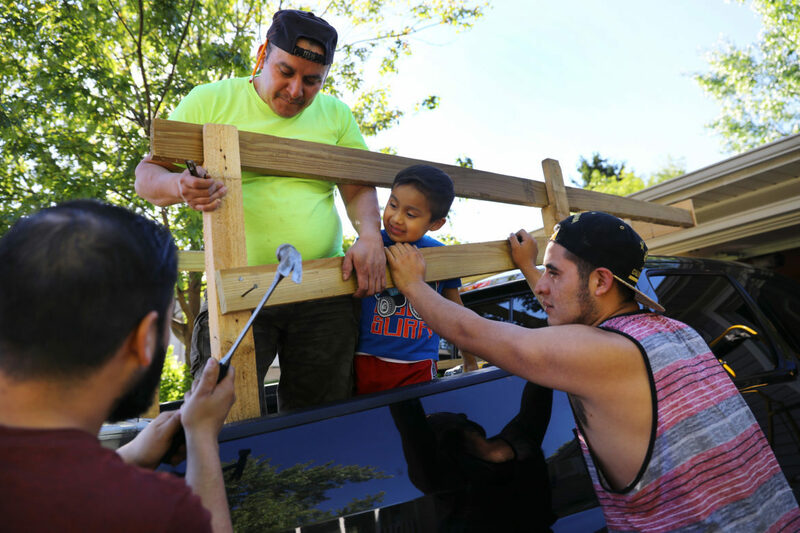 Miguel Hernandez, left, along with co-worker Pedro Tepole, center, and his cousin Eric Hernandez, build a structure on the back of Miguel's pickup truck on May 31, 2017, to help carry their belongings to Mexico. Thomas Hernandez, 5, watches the construction project. Hernandez and Tepole, along with three other dairy workers, left for Mexico the following morning. In the driveway of a two-story house on a dairy farm in western Wisconsin, five men focus on a unique construction project. Using a drill, hammer and nails, plywood and rope, they work together in the afternoon sun to erect a structure that resembles a makeshift corral in the bed of a Honda pickup. Every so often, Luisa Tepole, 25, carries a suitcase or packaged appliance out of the house, handing it to her husband, Miguel Hernandez, 36. Hernandez makes quick decisions about what can fit in the truck and what his family can live without when they begin their new life in Mexico, placing each item just so for the long trip back across the border. By the end of the night, the back of the truck is piled high with bags of clothes and shoes, TV sets in boxes and a bucket of children’s toys, ready for the 2,300-mile drive to Veracruz, Mexico. Farm owners Doug and Toni Knoepke watch Hernandez and the other workers from a few feet away as they load their two-truck caravan. It looks like a scene from “The Grapes of Wrath,” Doug Knoepke remarks, referring to the movie about the mass migration from the Oklahoma Dust Bowl to California in the 1930s. Only this time, it is in reverse: The migrants are leaving a land abundant with economic opportunity for an uncertain future in their homeland. Miguel Hernandez talks with herd manager Henry Yoder during his last shift on a dairy farm in Pepin County. Yoder said Hernandez was one of the only immigrant workers who knew how to fix and manage everything on the farm. Hernandez has been working on the Knoepkes’ farm in Pepin County for 16 years. He shares this home with his wife and two young sons, Thomas, 5, and Liam, 4. The house, where they live with several other workers, is so close to the barn that from their back door, the rhythms of Mexican Cumbia music can be heard coming out of a speaker in the milking parlor. Earlier in the day, at Thomas’ last day at Noah’s Ark Preschool in Durand, he cries as he tells his classmates that he will not be starting kindergarten with them in the fall. He has never been to Mexico, and his teacher pulls out a map to show the students where it is in relation to the United States. On June 1, Hernandez and four other men, who for years have milked and cared for cows on dairy farms among the hills of western Wisconsin, drive away in the direction of their mountainous hometown of Texhuacan. A few days later, Tepole and the children fly out of Chicago. The Hernandez family is leaving, in part, because of the threat of deportation — which could ban them from returning to the United States for 10 years — and what they describe as increasingly harsh rhetoric by President Donald Trump and others toward immigrants, especially those here illegally. Miguel Hernandez cleans a barn on his last day of work on a Pepin County dairy farm owned by Doug and Toni Knoepke. He said he did not want to work the day before he left, but the farm owners needed the help. At the time, they did not have anyone lined up to replace him as assistant herdsman. Like many immigrant dairy employees in Wisconsin, the workers in the caravan have stories about walking through the desert to cross the border illegally, coming to work for farmers in the United States eager for the help. They ended up here in America’s Dairyland, the nation’s top cheese state and No. 2 milk producer, attracted by a dairy industry dependent on undocumented immigrant labor to keep cows milked three times a day, year-round. They have raised their children in communities where American workers stopped answering “help wanted” ads for cow milkers long ago. And now, they are going home. Miguel Hernandez works his last shift on a Pepin County dairy farm owned by Doug and Toni Knoepke on May 31. In the first 100 days of the Trump administration, arrests by Immigration and Customs Enforcement (ICE) in the Midwestern region increased over the previous two years. In Wisconsin, farmers like Knoepke depend heavily on workers like Hernandez. Seeing him and the other workers leave worries this first generation farmer with 650 cows. Luisa Tepole walks her son Thomas Hernandez, 5, to the bus on his last day of school in the United States on May 31. Thomas' preschool class held a graduation ceremony later that day. The rest of his classmates will enter kindergarten next fall. Thomas, who is an American citizen, flew to Mexico with his mother and brother Liam a few days later to start a new life with his family in his parents' hometown of Texhuacan, Veracruz. In May, U.S. Sen. Ron Johnson, R-Wis., introduced a bill that would let states create their own visa programs for foreign workers. According to the libertarian Cato Institute, which supports the measure, Canada and Australia have similar programs. Four dairy associations endorsed the proposal, but it has not yet received a hearing. Tougher U.S. immigration policies are creating concern on the other side of the border as well. Hernandez’s brother, Damaso, who also works at a western Wisconsin dairy farm, says many workers he knows are considering whether to stay or go. As a candidate, Trump declared that the United States was a dumping ground for drugs and criminals from Mexico. He promised sweeping deportations and to build a wall between the two nations. Thomas Hernandez, 5, participates in his last day at Noah's Ark Preschool at Assumption Catholic School in Pepin County on May 31. “Because they’re scared of the government, a lot of families are leaving. Because they can’t get around comfortably anymore because they’re scared of getting taken and deported,” Damaso Hernandez says. “It’s strange, it’s difficult because all the Hispanic people knew the Americans here in Wisconsin were supporting Donald Trump. Trump was the first Republican presidential candidate to carry Wisconsin since 1984. ICE figures show arrests in the six-state Midwestern region including Wisconsin are rising since Trump took office, Wisconsin Public Radio has learned. The agency reports that arrests in the Chicago region rose to 2,599 between Inauguration Day, Jan. 20, through April 29, the first 100 days of the Trump administration. That figure exceeds arrest totals from the same period in the previous two years under President Barack Obama. However, it is lower than the same period in 2014, when there were 3,033 arrests. Nationwide, ICE arrests totaled 41,898, about 35 percent higher than last year but lower than the 2014 figure of 54,584. Luisa Tepole packs personal items in preparation for her family's journey to Mexico while her husband's nephew, Hernan Hernandez, hangs out on the couch. Miguel Hernandez was leaving two days later for Mexico. In the foreground is their son Liam, 4. The family shared this home on a Pepin County dairy farm with several other workers. Randy Capps, director of research for U.S. programs at the Migration Policy Institute, a nonpartisan group that analyzes the movement of people worldwide, says there can be a “pretty substantial lag” between arrest and deportation. Factors include whether the person contests the deportation. “And that lag can be anywhere from a few days — if they have a prior removal order that’s simply reinstated — to several years, if they decide to contest their deportation and they’re let out of detention on bond,” Capps says. The Trump administration is working to pressure local law enforcement agencies and governments to help federal authorities identify and arrest undocumented residents. The president’s budget proposes withholding funds from so-called “sanctuary cities,” jurisdictions that decline to work hand-in-hand with federal agencies to enforce immigration laws. In May, Texas Gov. Greg Abbott signed a bill into law that allows local police officers to question individuals about their immigration status when they are detained or arrested. It also penalizes local officials who do not cooperate with federal immigration agents by handing over people subject to deportation. Republicans in the Wisconsin Legislature have proposed a similar bill. Implementation memos issued by the U.S. Department of Homeland Security earlier this year expanded ICE’s target from individuals convicted of serious crimes to those charged with even low-level offenses. The memos also direct that no one in the country illegally is exempt from deportation. Thomas Hernandez, 5, waits in a church basement with his 4K classmates from Noah's Ark Preschool at Assumption Catholic School before their graduation ceremony on May 31. Nationwide, the number of non-criminals arrested by ICE in Trump’s first 100 days more than doubled from the same period last year, to 10,934 from 4,372. In the Chicago region, for example, 778 of the 2,599 people arrested by ICE were not convicted criminals; last year, 500 non-criminals were arrested during the same time frame. What that means is that people who come into contact with ICE, even if they are not being sought by the agency, could still be arrested. Luisa Tepole takes a photo of her son Thomas Hernandez with his preschool teacher, Angela Tulip, after the graduation ceremony for Noah's Ark Preschool at Assumption Catholic School. Miguel Hernandez stands behind her. A farmer in Wisconsin’s Trempealeau County, who asked not to be named because he fears reprisals from immigration authorities, says ICE agents who visited his farm this spring looking for a particular person warned him they knew the rest of his employees were also undocumented and that they would be back. A worker who spoke to Wisconsin Public Radio at another farm in Pepin County shared a similar report. Experts like Feliz, however, say there is no evidence of the type of sweeping raids carried out near the end of the George W. Bush administration. ICE may be under pressure from businesses not to run intensive operations in fields or factories where many undocumented immigrants work, Capps says. “If they were to take a bunch of agricultural workers, or even if they were to scare a large number of agricultural workers away, that could have a bad impact on the local economy,” he says. Thomas Hernandez, 5, hugs his friend Brayden Patnode, after the graduation ceremony for Noah's Ark Preschool at Assumption Catholic School. Brayden's mom, Jennifer Patnode, left, had just learned the Hernandez family was moving to Mexico, and that Thomas would not be back at school the following year. University of Wisconsin-Extension agent Jennifer Blazek says immigrant dairy workers across the state remain uneasy. As rumors circulated that ICE had visited Durand, four other dairy workers decided to join Hernandez, whose reasons for leaving include returning to see his ailing father. “I think the family is the most important thing for all of us,” says Hernandez, who always knew he would someday return to Mexico. He and his friends determined it was best to go now — organized, relaxed and with a plan. Miguel Hernandez, along with two friends, builds a structure on the back of his pickup truck on May 31, to help carry his belongings to Mexico. If you are deported, he says, “You take the clothes you’re wearing … and that’s it.” But with a planned departure, Mendez says, immigrants can keep their belongings and money. Still others, like Hernandez’s brother Damaso — who has lived in the United States for 17 years — say the time has not come to leave, but the situation could change at any moment. He thinks about the effect of leaving on his four children, who were raised in Wisconsin. “My kids are very accustomed to life here. The truth is, I don’t know what type of life they would have over there. Would they adapt quickly or…,” he trails off. “That’s what scares me most is the adjustment … life is different over there. Miguel Hernandez, left, talks with his wife, Luisa Tepole, about what to load into their pickup truck as they prepare to return to their hometown in Mexico. His cousin, Eric Hernandez, and co-worker Pedro Tepole, right, help to load the truck a little after 8 p.m. on May 31. Miguel and Pedro had already worked a full-shift on the Knoepke's dairy farm in Pepin County, Wis. It is 7:15 in the morning on May 31. As the sun peeks over the hills to the east, workers are up and in action. One drives a tractor through the fields while another steers a feed truck between two rows of cows. All the while, men in the milking parlor never stop moving. Some have been working since 11 p.m. and are just finishing their shifts. At this hour, everyone on the farm is an immigrant from Mexico. Miguel Hernandez hoses off his boots in the milking parlor at the end of his last shift after 16 years on a Pepin County dairy farm. He punched out at 1 p.m., as his final shift officially ended. For Hernandez, today is just like any other workday over the past 16 years, except that it is his last. He does not want to work today, but his bosses say they really need the help. He opens and closes metal gates, shoo-ing cows in and out of the milking parlor, and sweeps piles of manure and feed off the floor of the barn. Tepole is excited. She has not been back home in the 11 years since she first came to the United States. Her parents have never met their grandchildren, and her mother is happy they are coming home. At school, Thomas’ teacher gives the students certificates to congratulate them on finishing the school year. On Thomas’, she writes her address and encourages him to write from his new home. Doug Knoepke, owner of a large dairy farm in Pepin County, Wis., hugs Miguel Hernandez on May 31, as he prepares to leave after 16 years. "I don't know where the industry would be without (immigrant labor) right now," says Knoepke. Miguel, his assistant herdsman and "right hand" man has proven difficult to replace. Hernandez knows his decision to raise his children in Mexico will affect their future, especially when it comes to education. “It’s a huge difference in school here compared to the school in Mexico. I think we are a lot behind in Mexico, but … it is what it is,” Hernandez says, shrugging his shoulders. Miguel Hernandez waits in Laredo, Texas after his pickup truck failed an emissions test while attempting to cross the U.S. border with Mexico. The truck was cleared later that afternoon, and Hernandez has since reunited with his wife, children and extended family in the state of Veracuz, Mexico. When Hernandez told his boss he was leaving, he was offered more money to stay. The farm owners even offered to buy a trailer for the other workers so he and his family could live in the house alone. But Hernandez turned it down. Four or five people have applied for Hernandez’s job, but none has worked out, according to herd manager Henry Yoder. Knoepke says he probably will need to promote from within. Hernandez says the farm owners want him to come back legally if that ever becomes possible.